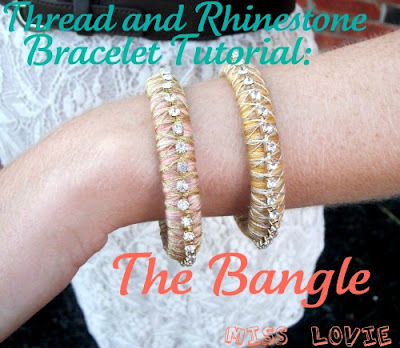 Yesterday I showed you how to make the Thread and Rhinestone Bangle so today I'm going to show you how to make the Braided version! 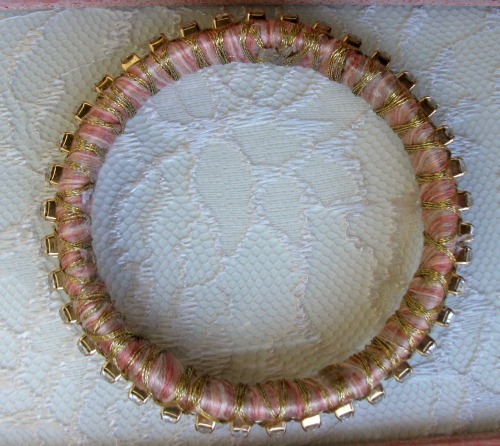 This is the second bracelet I made for my audition on SYTYC This bracelet is a little more difficult to make than the bangle maybe, but you can still do it!! 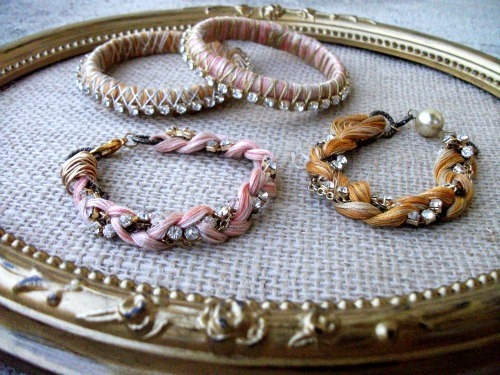 I seriously love these bracelets. They are so fun and pretty. Four different, but coordinating colors, of chenille embroidery thread, about 2 1/2 times the length of the diameter of your wrist (depending on how loose you want the bracelet) I used about 24 in. and it was a little long, but it can always be trimmed. Rhinestone chain (I bought mine when it was 40% off and I had a coupon at Hancock's Fabric), 8-12 in. 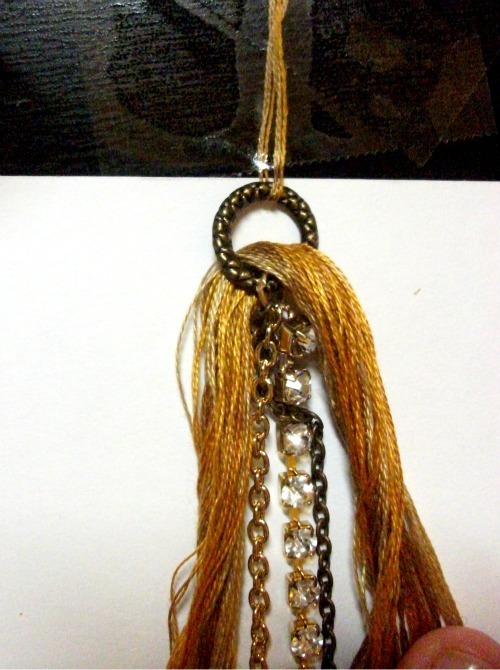 Gold chain and antiqued bronze chain, 8-12 in. 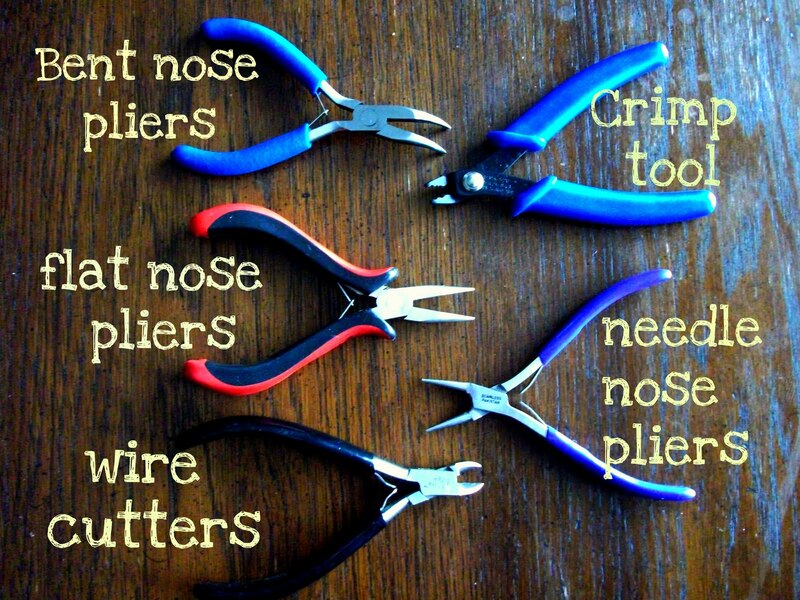 You'll also need all tools above minus the crimp tool. 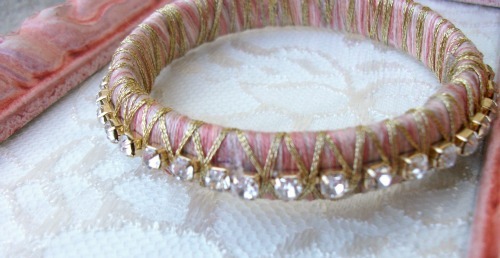 Ok first you'll do the same technique to get the colors all mixed together like in Thread and Rhinestone Bangle Tutorial. This is optional, but I think it looks really cool. First you want to cut about 24 inches of embroidery thread from each color. 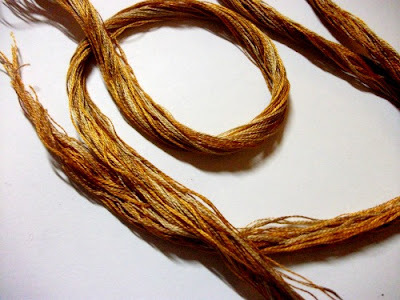 Then you are going to separate the threads into 2 strands each. 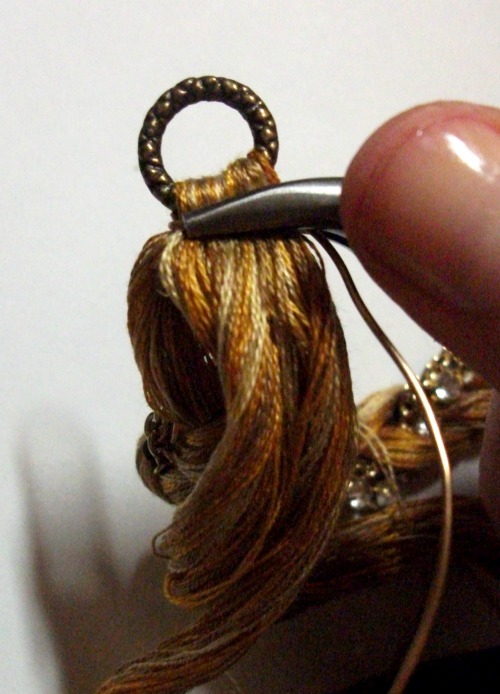 Each thread comes with 6 threads twisted together so you'll separate it into 3 sets with 2 strands in each set. Once you do that to both sets from the same color you'll have 6 sets with 2 strands in each set. Do that with the rest of the colors and you'll have 24 sets with 2 strands in each set. 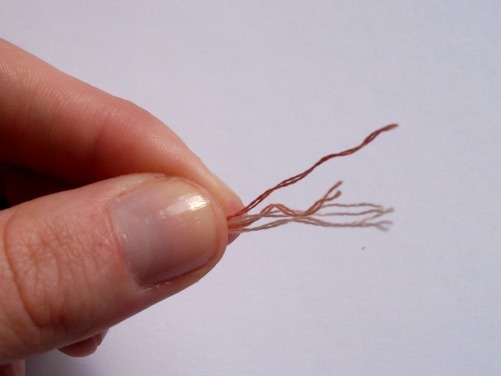 I don't know if my way is the right way to separate embroidery thread, but I always hold one end of the thread between my knees and pull the threads apart slowly. This keeps it from tangling so much. 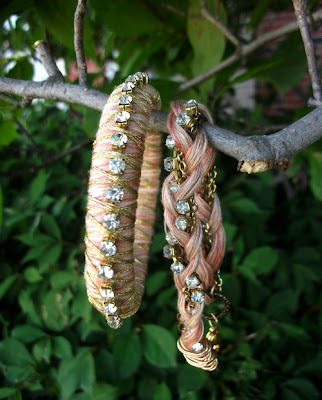 If it tangles, let it untwist some and be patient. If you pull too hard, it will knot. After your thread is ready you want to put the threads together by alternating colors. 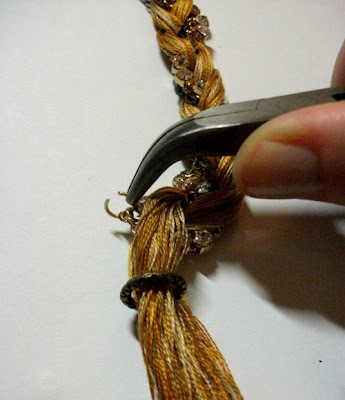 On every thread you add, run your thumb and index finger along the entire length of the joined threads to keep them together to reduce tangles and knots. When you're done adding all the thread it should look like this. See how the colors are all mixed together? Cut each end for a clean edge to work with. 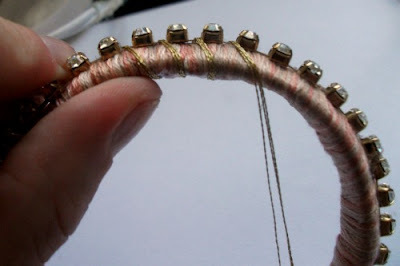 Slide the embroidery thread through one of the solid connecting rings so that there is an equal amount on each side. 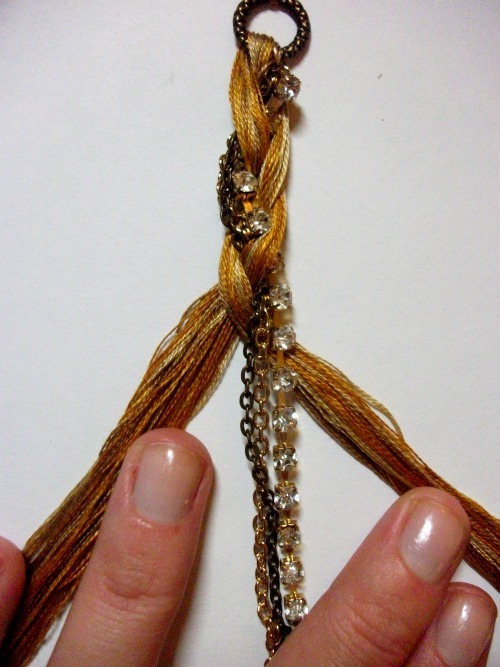 These will make up two parts of your braid. To make the third part of your braid you're going to put all chains (rhinestone, gold, and antiqued bronze) on a large jump ring. Before doing that you have to create a connector from the rhinestone. Here is the crimp connector. As the picture above shows, the flat parts that stick up are going to be folded down between the rhinestones to hold it in place. The loop will be under the rhinestone and it will help you connect the rhinestone chain to the large jump ring. 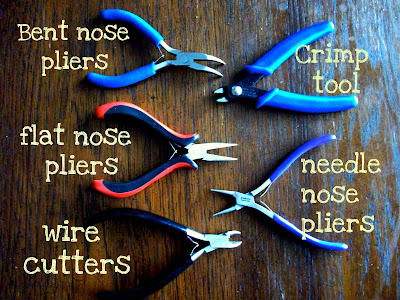 Fold one end down first using your (patience) and bent nose pliers. Then fold the remaining flat part on top of the other. 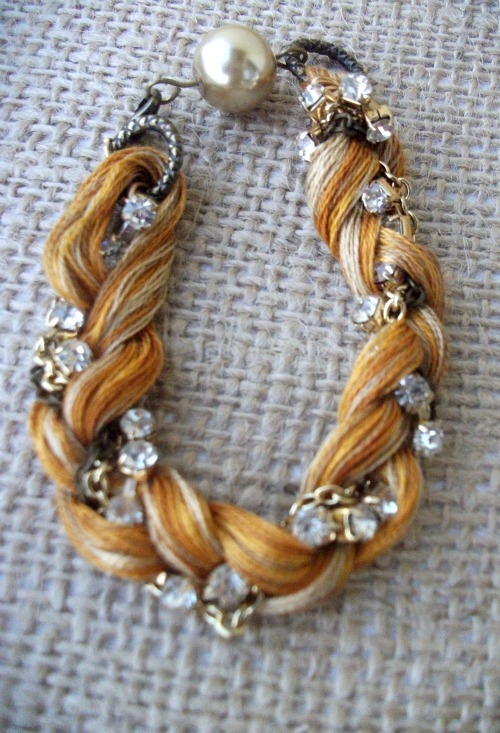 The back of the rhinestone chain should now look like this with the loop behind the rhinestone. 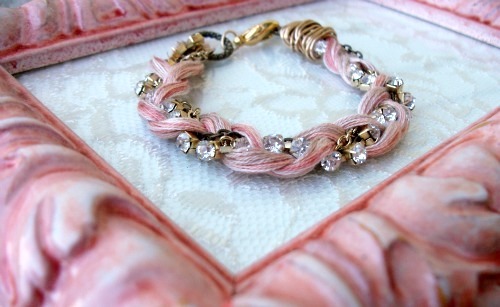 Then slide the two chains and the small jump ring connected to the rhinestone chain onto the large jump ring and close the jump ring around the large connecting ring between the two embroidery threads. 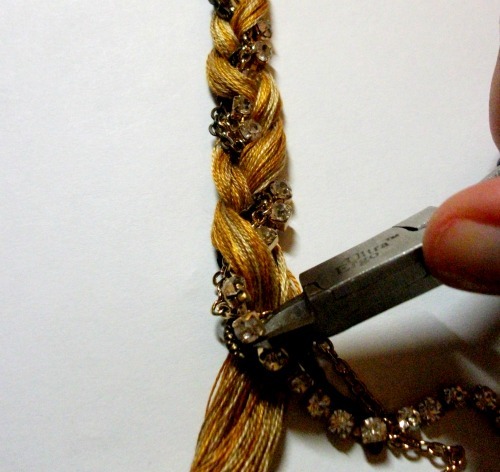 The chain cluster will act as the third part of the braid. 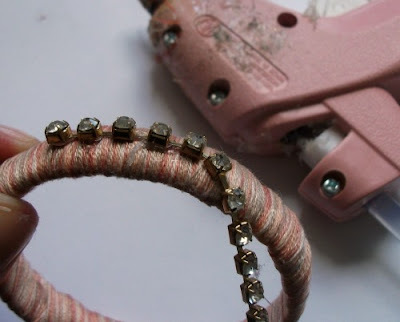 Now you're ready to braid! 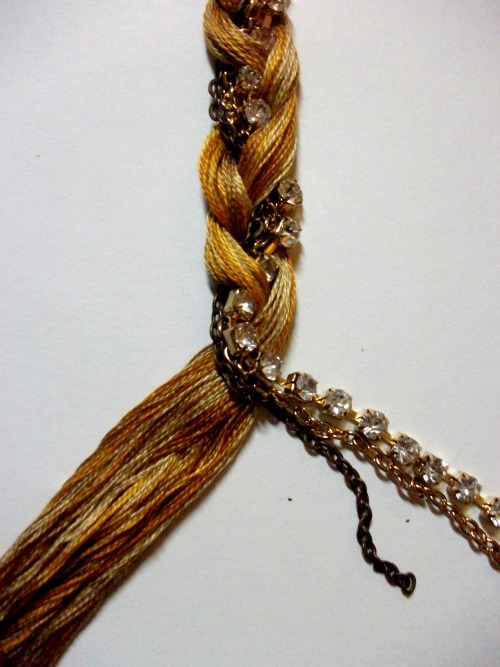 Braid as you normally would being super careful the settings on the rhinestones don't snag the embroidery thread. 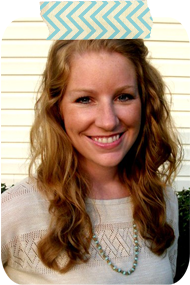 Make sure the braid is tight enough that it won't fall apart! 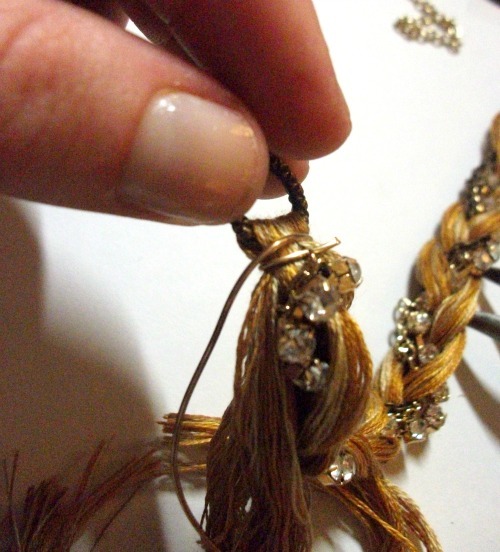 Try to fit the thread in between the rhinestones when you cross over the chain cluster so you see as many rhinestones as possible and to help keep the braid tight. 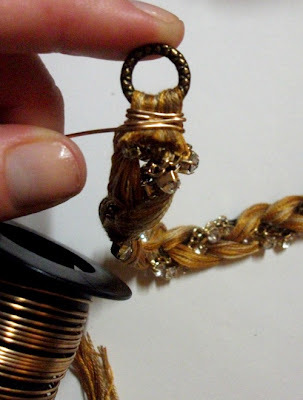 When you have your braid done to the desired length, push all the embroidery thread to one side and run the thread through your fingers to get it nice and even and looking like a cohesive piece. 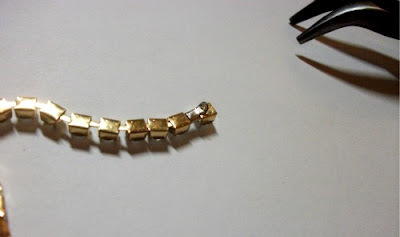 Add a crimp connector to the rhinestone chain again as described above, then add all chains to your second large jump ring and close the jump ring around the solid connecting ring. 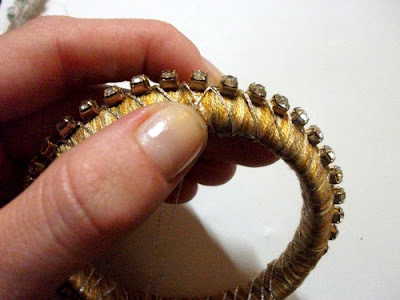 Loop your embroidery thread around the solid connecting ring and pull tight. Use the wire to wrap around it once and twist the end around itself once. 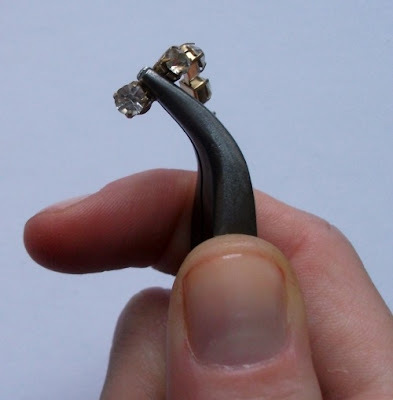 Do this very close to the solid connecting ring so you can work your way down. Here you can see the wire wrapped around itself once. 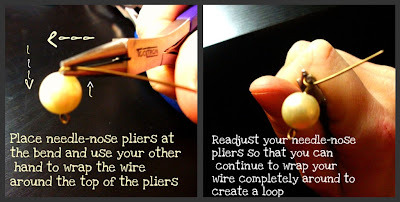 In between each wrap use your pliers (doesn't matter which one but I usually find I have more control with my bent nose pliers) to clamp the wire down flat. Be sure the wire is tight around the thread. A couple of wire wraps away from being finished, cut the excess thread off (not pictured) and continue wrapping the wire (and crimping it down) to enclose the loose thread ends. When you're done, clip the wire with the wire cutters so that the wire is in the middle of the bracelet and bend the wire in towards the bracelet with the bent nose pliers. The arrow above is pointing to the bent wire. Tuck the bent wire into the thread and up under the wire as shown above. 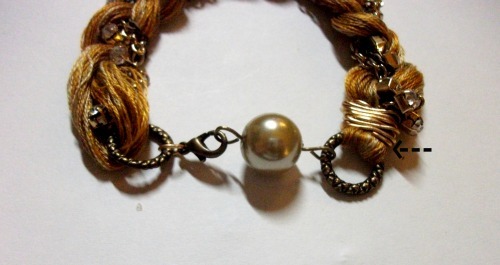 I purposely made my braided part a little shorter so I could add that fun goldish pearl to the clasp. 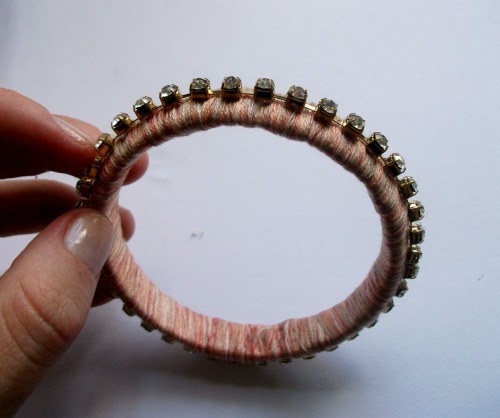 You could even wrap wire around the other side in the same manner and it would look pretty cool, too. I might do that next time. 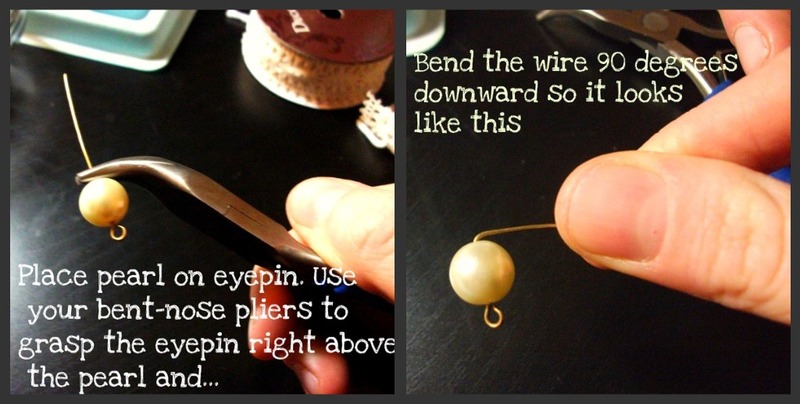 To make the clasp like this, simply take the eye pin and slide the pearl onto it and create a simple loop above the pearl. See pictures below to make a simple loop. 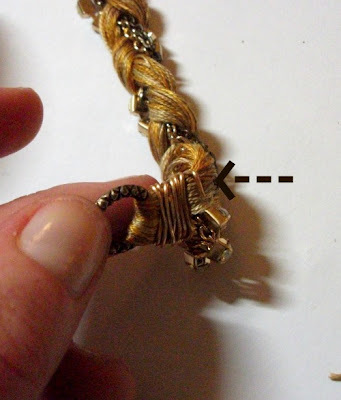 Open the loop to connect it to one side of the bracelet. 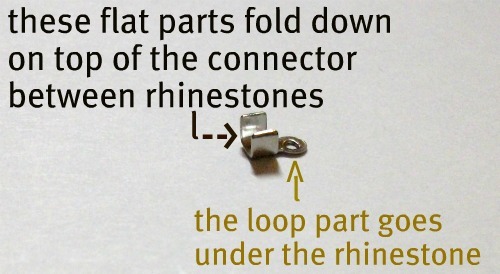 Connect the clasp to the other solid connecting ring with a large jump ring and use the other simple loop on the pearl to clasp the bracelet together. 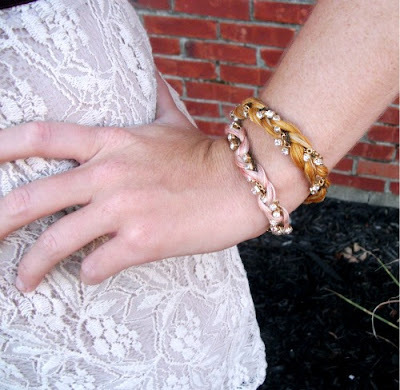 And no, that bracelet is not made of hair like someone on Pinterest obviously thought at first. See their comments here. I literally laughed out loud when I read those. Yikes. If I ever make anything out of hair you have my permission to call me seriously crazy and I'd hope you wouldn't read my blog ever again. HA! Hope you enjoyed the tutorial! 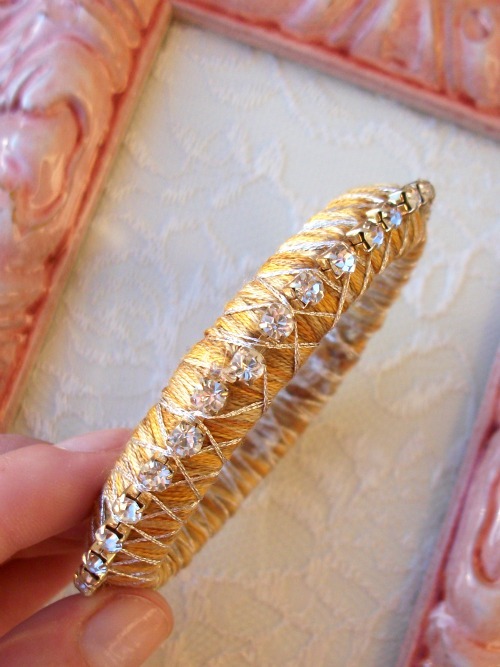 If you missed it, be sure to go check out the Thread and Rhinestone Bangle Tutorial that matches this one! Thanks for reading. I'll be linking to the parties on my sidebar! Today I'm showing you Tutorial #1 of the mixed media bracelets I made for SYTYC: the bangle. It's really super easy and I think you'll love it! 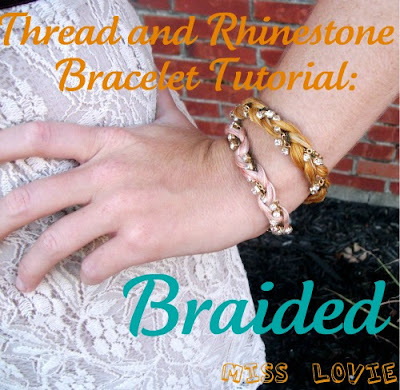 Be sure to check back tomorrow for the braided one! First you have to find some super cheap bangles. Since you'll be covering them up it doesn't matter what they look like. A place like Walmart would be a good place to look. 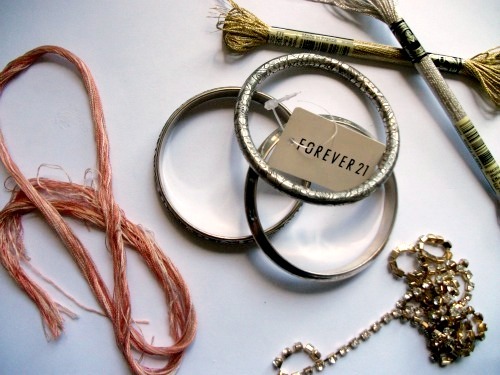 Mine came from Forever 21 and were $2 something for 3 bangles and were a good width. The width should be at least an inch wide or more. 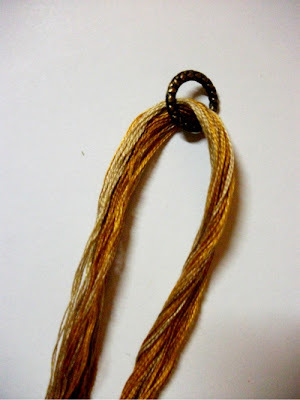 I separated the colors and put them together again so the different colors were made into one large mixed thread. This is optional, but I think it looks really cool. First you want to cut 2 sets of about 70-80 inches of embroidery thread from each color (depending on how much you overlap as you wrap). Then you are going to separate the threads into 2 strands each. 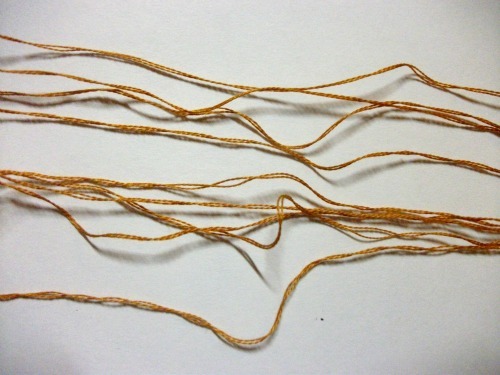 Each thread comes with 6 threads twisted together so you'll separate it into 3 sets with 2 strands in each set. Once you do that to both sets from the same color you'll have 6 sets with 2 strands in each set. Do that with the rest of the colors and you'll have 24 sets with 2 strands in each set. yourfingers like I always do. 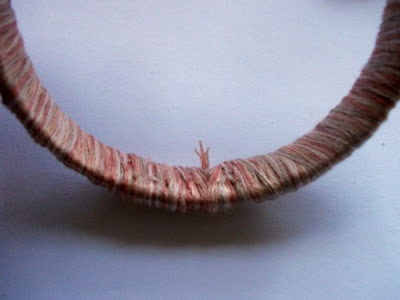 Then start wrapping your thread around. 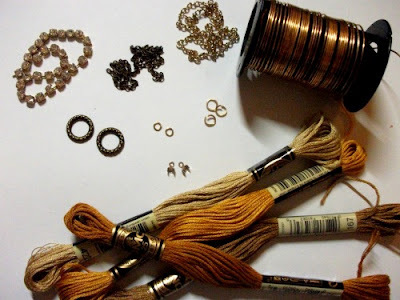 You want to keep your thread flat and spread out. 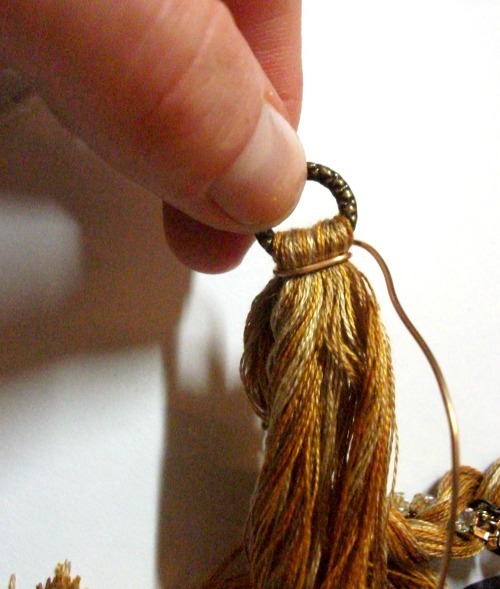 You can overlap the thread in some parts, but be sure it stays even and isn't thicker in some spots than others. 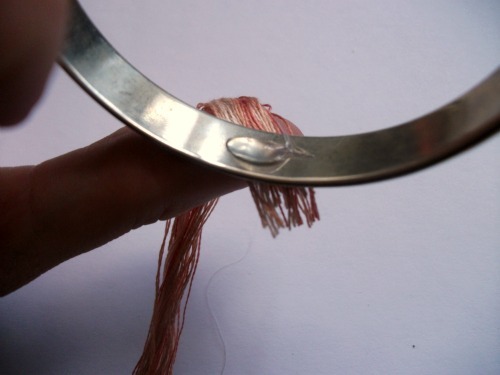 You will probably have to continually run your thumb and index finger down the thread to untangle any knots that pop up. 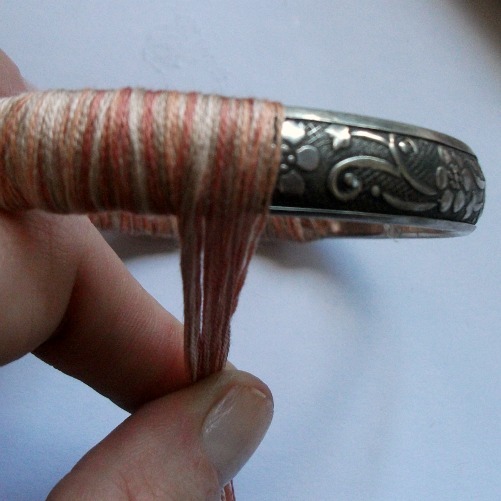 Keep going until the bangle is completely wrapped. 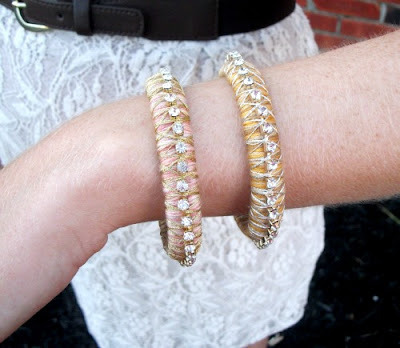 You want the ends to finish on the inside of your bangle. If they don't, trim them so that the do. I used Mod Podge to glue the threads down. I painted on some Mod Podge to the bracelet, pressed the threads down, put some more Mod Podge on top and held my thumb on top for a little bit. Let dry for a couple minutes until you're sure it will stick. 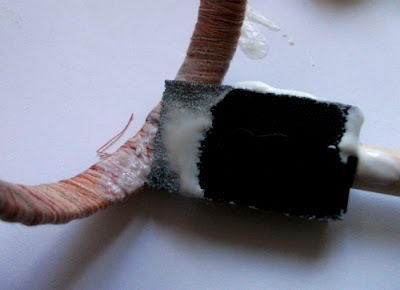 You can use a tiny dab of hot glue instead if you want, but it won't look as smooth as the Mod Podge. I tried both ways. The hot glue sets quicker, but if you're not careful with how you put it on, it doesn't look awesome. 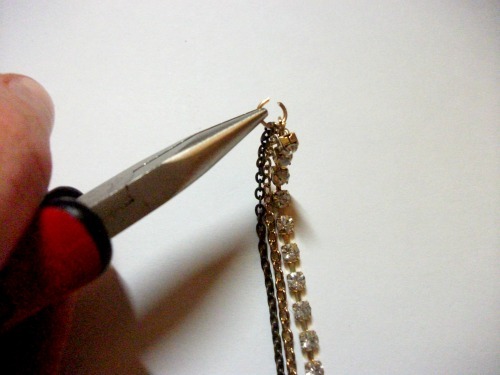 When it's dry, you'll glue the rhinestone chain to the middle of the bangle. Put tiny dots of hot glue under each rhinestone. This will not hold it on there super tight, but it'll hold it enough until you wrap it with the metallic embroidery thread. Trim the rest of the chain off when you meet the beginning of the chain. Glue down carefully. 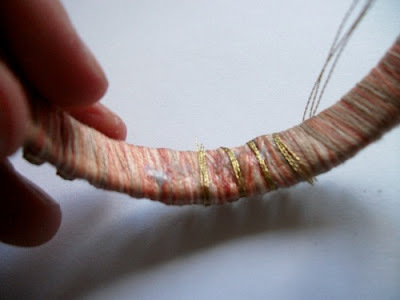 Glue down the end of metallic embroidery thread. I did find that hot glue worked best on the metallic thread. Place a dot of hot glue down. Let cool for a few seconds then press the thread on top with your thumb. It'll be warm but should not burn you. Pull finger off gently. Then start wrapping the metallic embroidery thread around. On this bracelet I used 3 strands (pulled apart from the 6 strands it comes with) and on the yellow orange one I made like this I used 2. Just experiment and see how wide you want the metallic part to be. You'll need about 70-80 inches of metallic thread. Wrap it on top of each connector piece between rhinestones at an angle. 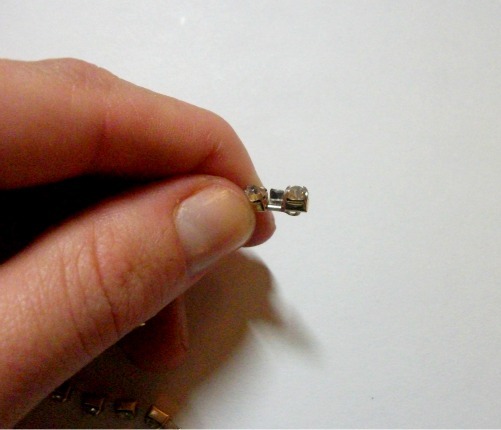 Be careful not to push on the rhinestones too much or they will become unglued. When you get back to where you started, start wrapping the opposite way. 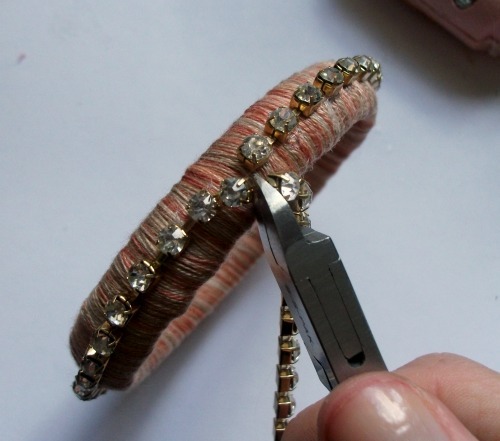 While wrapping, try to make Xs on either side of the rhinestones like the picture above. 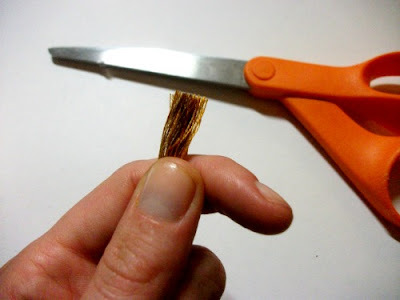 When you reach the end use the hot glue method to glue the ends down. And done!! As you can see, the wrapped metallic thread is not super perfect, but it still looks cool, I think! Here it is with the three strands of metallic. And here it is with only two strands. Be sure to check out Tutorial #2 of the Mixed Media Bracelets: the Braided Thread and Rhinestone Bracelet! Linking to all the parties you see on my sidebar! And if you make one I'd LOVE to see it. Post it to my Flickr pool or just email me! The Voting Paid Off! Thank you! !